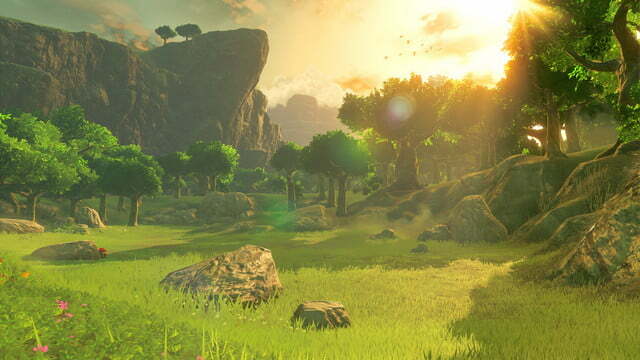 Finally, after years of waiting, Nintendo revealed gameplay for the highly anticipated The Legend of Zelda: Breath of the Wild, dedicating the vast majority of its E3 2016 live stream solely to the game. We got several in depth looks at Breath of the Wild throughout the day, and learned a ton of new info about the game. Here’s everything you need to know about the upcoming title, which will come out in March 2017 for Wii U and Nintendo NX. We’ll update this article throughout the day as Nintendo shows off footage and we learn more about the game. The first gameplay session of the day showed the opening moments of the game. 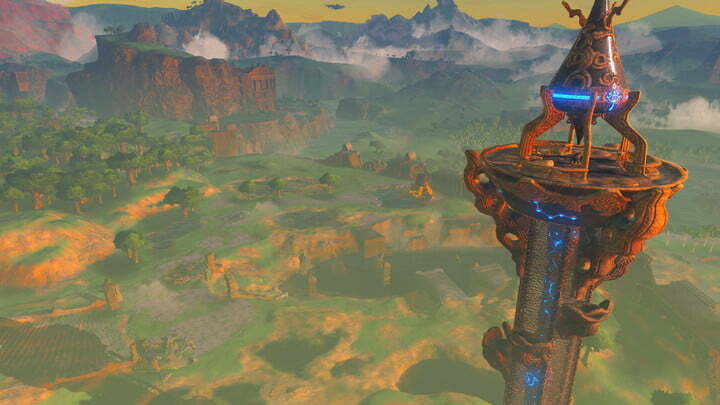 Link wakes up in a strange contraption in a chamber called The Shrine of Resurrection (more on this later). The area features strange sci-fi like equipment that differs from the sort of thing we’ve seen in previous Legend of Zelda games. Link is beckoned by a female voice, introducing us to the first full voice acting we can remember in a Zelda title. Link receives a device called the “Sheikah Slate” (which bears a fleeting resemblance to a stylized Wii U tablet controller). It acts as your inventory management system, map, and quest tracker in the game. 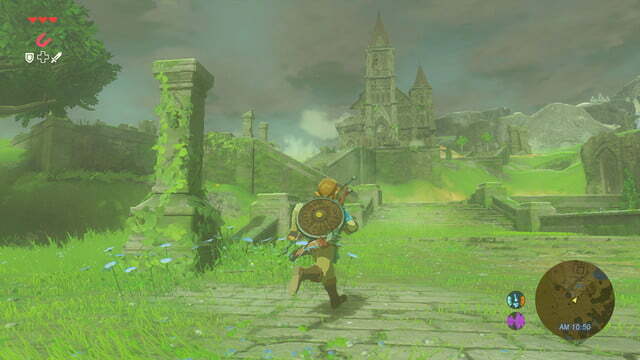 Breath of the Wild’s minimal HUD is a departure from recent titles in the series, especially Skyward Sword, which bombarded the player with information, cluttering the screen, and explained exactly where to go and what to see. Breath of the Wild, on the other hand, shows only important information like a mini map and health meter, and minimalist icons for equipped items. A stamina gauge appears contextually to inform how much you can climb, sprint, or jump (yes, you can jump in this game). Otherwise, the screen is open and free of clutter. Once Link exits the cave, the story takes a back seat. From there, you will be able to explore and play at your own pace, creating your own adventure. Of course, there will be a story to follow, but if you wish to discover the secrets of Hyrule instead, you’re free to do so. This is a new direction for the series, which had become more directed and focused for the last two decades. Breath of the Wild takes The Legend of Zelda back to its roots in terms of open-ended, non-linear exploration and gameplay. It’s so open, in fact, that the game can be completed without even seeing the entire story, let alone completing every challenge. Breath of the Wild’s version of Hyrule is truly massive. 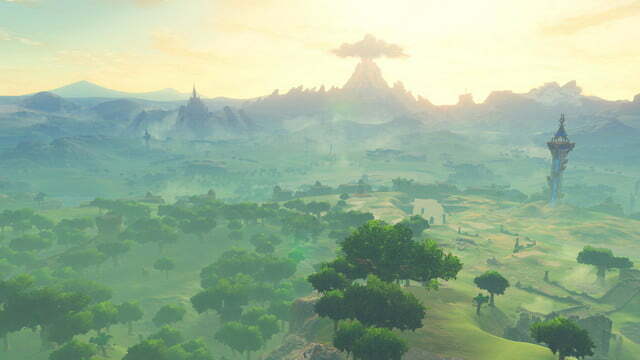 The opening area of the game was the focus of the demo — itself an enormous section of the game with numerous landmarks on the horizon and a seemingly endless amount of stuff to do and explore — but the entire map was teased, and it looks massive. Its many areas and dungeons are open to be explored and tackled in any order. 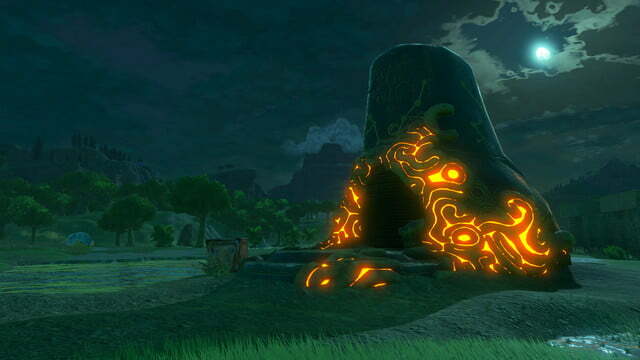 There are also over 100 “shrines,” smaller puzzle-filled locations separate from the usual dungeons, that can be completed in whatever order you wish. 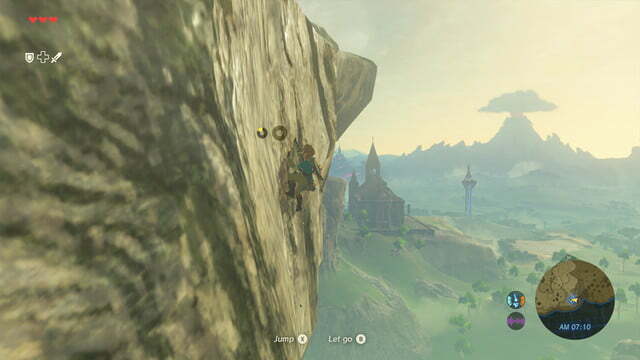 Of course, you can travel — either by foot, by horse, or by climbing — anywhere and everywhere in the game world. This is a change from past Zelda games, which restricted you to only certain areas within strict boundaries. Furthermore, Link will exploring alone; there is no Navi or Midna-like character helping guide you (except for Amiibo pets, which we discuss below). You’re free to play as you wish. Breath of the Wild will have an important impact on the greater Zelda lore. The world isn’t just big, though, it feels alive. Time and weather changed dynamically as the demo was played, and enemies behave differently based upon the time of day. 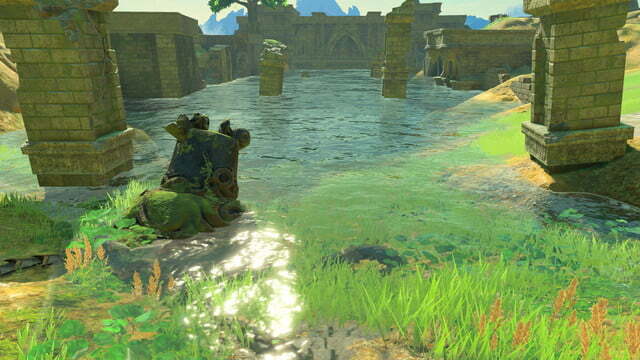 For example, when night falls, Moblins may fall asleep while Stalfos emerge from the ground. 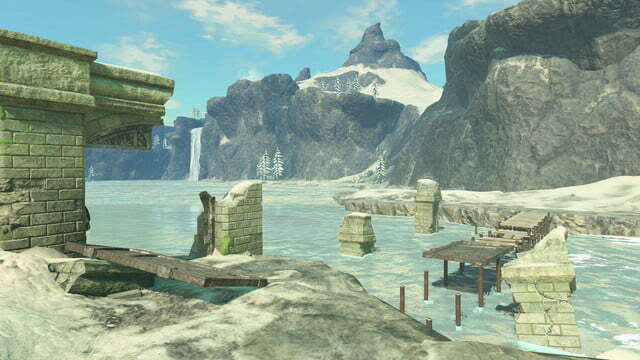 In colder environments, Link will need to equip heavier clothing to protect himself against the elements. But while players must be mindful of their surroundings, they can also manipulate the environment themselves; Bombs can be used to destroy obstacles, you can set fire to tall grass, and you can use objects like boulders or explosive barrels to take out enemies. This opens up sandbox-like possibilities, such as setting up traps or creating bridges by felling trees with an axe. As you explore, you’ll come across various items and materials to collect, such as ores and tree branches. We assume this means there is a crafting element to the game. Some items, such as apples, meat, mushrooms, and vegetables, can be eaten or cooked to replenish health. 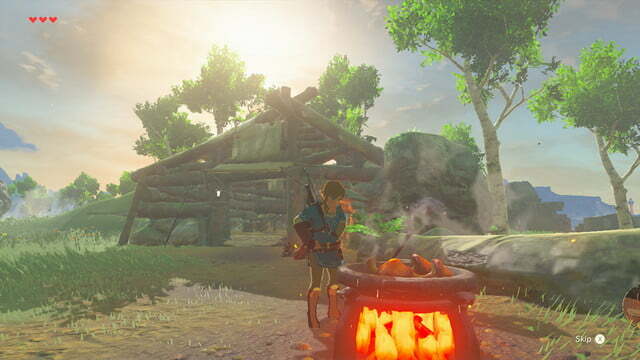 This replaces collecting hearts to replenish health that all previous Zelda games have featured, and adds a level of realism that is new to the series. Even though there are many gameplay systems happening, and plenty to do and see, the moment-to-moment gameplay is quite immersive. 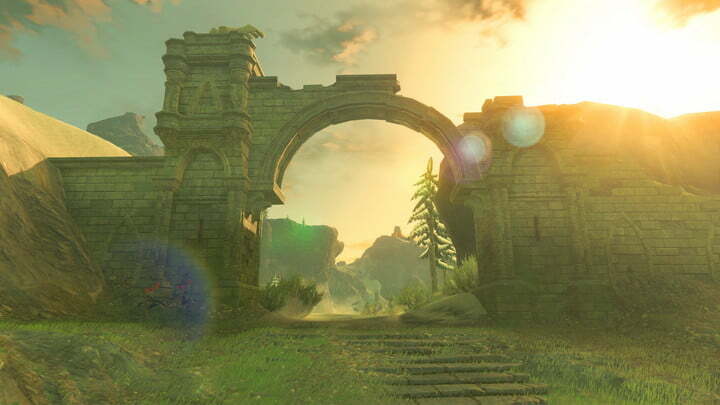 The aforementioned HUD stays out of the way, allowing you to take in the beautiful landscapes. Subtle piano chords underscore moments while exploring, while music swells during combat. 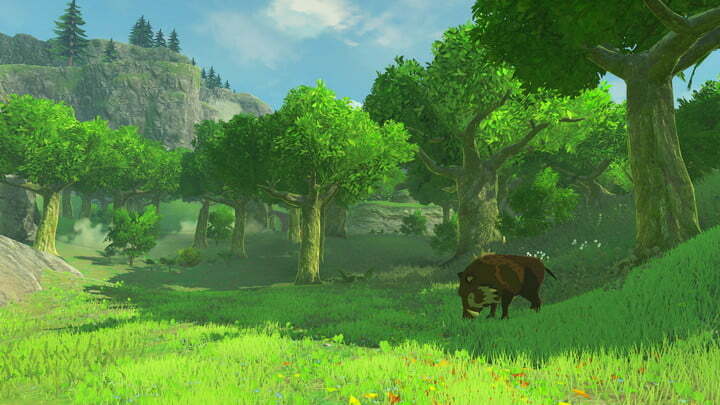 Nintendo of America employee Bill Trinen and Zelda helmer Aonuma San took a moment during the demo to talk about Breath of the Wild’s art style. Taking inspiration from Japanese animation, the game’s visual style and design was based off of gouache painting — a style of painting often used in animation. These inspirations make sense, especially when comparing Breath of the Wild’s logo design to the title logos of Studio Ghibli films. A stronger comparison would be to the earliest games in the series. Stylistically, Breath of the Wild is reminiscent of the concept art for the original Legend of Zelda and its sequel, The Legend of Zelda: The Adventures of Link, with subtle similarities Wind Waker and Skyward Sword’s highly stylized, paint-like looks. 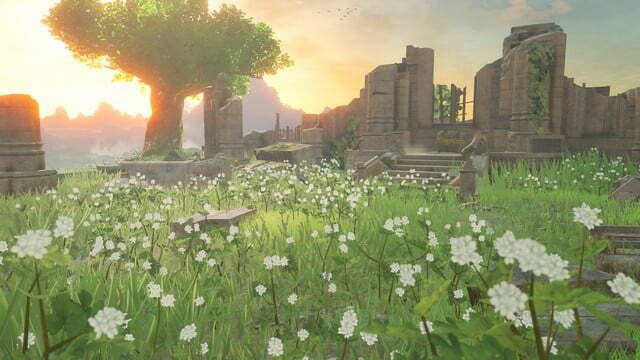 A major departure from previous games is the expanded inventory of Breath of the Wild. You will be able to pick up and equip many types of tools and weapons, such as axes, clubs, swords, and shields. 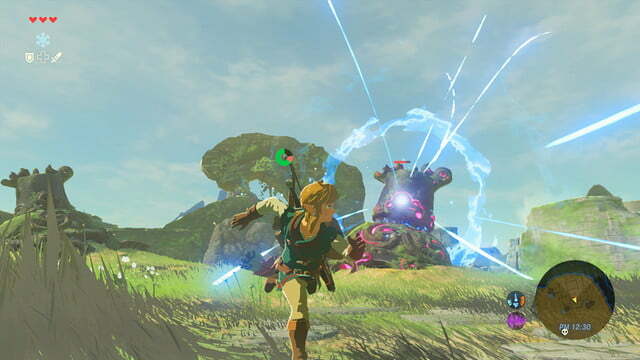 In the past, Link simply used one set of equipment throughout the game, but now there is a bevy of loot to collect and use. This also applies to clothing and armor. Different outerwear will provide better defense or protections, and will have to be managed for optimal defense. Unlike any other Zelda games, you equipment applies different stats to Link, and decays with use. 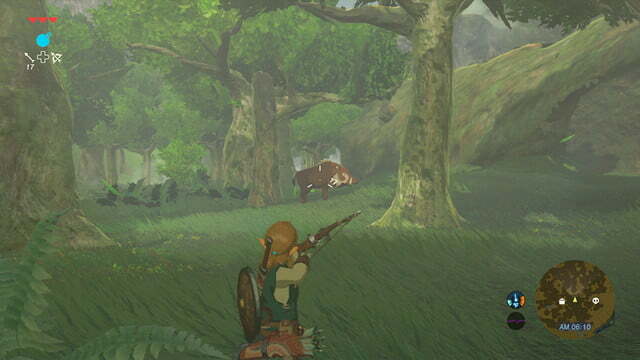 You will need to manage and collect combat equipment continuously to survive against the numerous enemies of Hyrule. 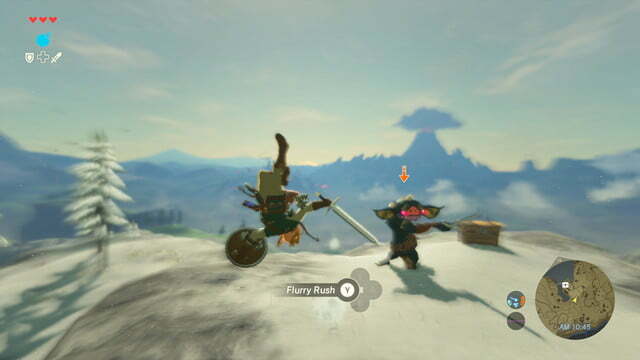 Equipment also isn’t used simply for combat; you can use items in weird ways, like snowboarding on a shield. The game encourages you to collect and use a huge variety of items and lets you hot swap between them with the R button. Of course, it wouldn’t be a Zelda game without a ton of cool secondary items. 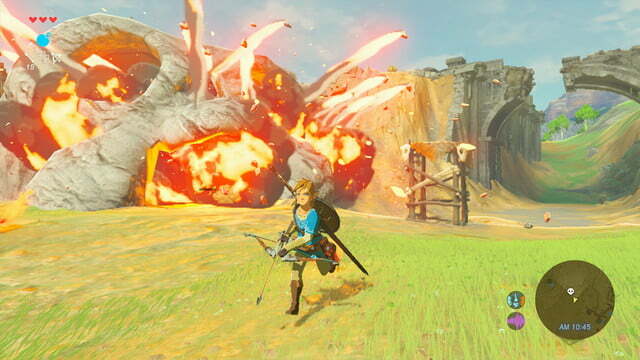 Fire arrows, multiple bomb types, a paraglider, and a magnet items were all shown off. The magnet is especially interesting because you can use it to move metal objects and manipulate certain aspects of the landscape. All of these items helped open up new areas and methods of exploration. 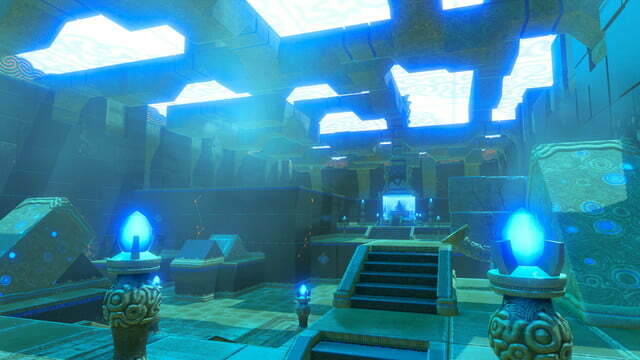 As mentioned above, the gameplay demo began by showing off a seemingly more sci-fi themed area of the game than you would normally expect from the Legend of Zelda. Those Sci-Fi elements are present throughout the world. 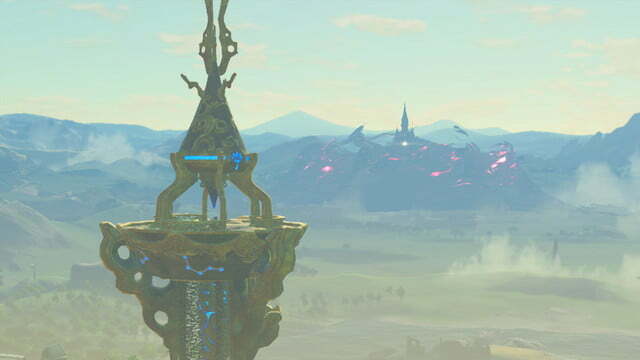 Massive robotic creatures called Guardians lie dormant in remote locations throughout Hyrule, and are ostensibly tied to some sort of threat plaguing the land — one that Link seems to have been awakened to fight. These subtle additions are yet another departure from the common Zelda story tropes, and we’re eager to find out what exactly they mean. By using the Wolf Link Amiibo, Link can summon a Wolf Link partner character to aide in his adventure. Wolf Link will aide in combat by attacking enemies and hunting animals. Wolf Link’s heart meter will be saved from your progress in the Wii U version of Twilight Princess, and he will remain your companion as long as his heart containers remain filled. Other new Amiibos, such as the newly revealed Archer Link Amiibo, Rider Link, and Guardian Amiibo, will all be compatible with Breath of the Wild. These new Amiibo figures will launch alongside Breath of the Wild next year. Luckily, it isn’t all new! It wasn’t all new, of course. Plenty of familiar Zelda elements and characters will be in Breath of the Wild. Wind Waker’s adorable race of tree people, the Koroks, were some of the various NPC populating the land. Allusions to mainstay aspects of the series story and lore, such as the Goddesses and Link’s arch-villain Ganon, were mentioned during dialogue. 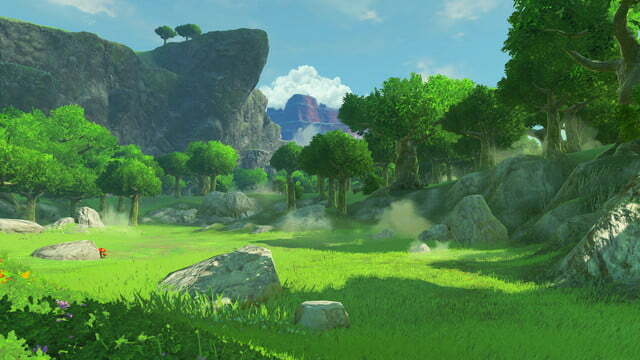 The iconic Master Sword also makes an appearance during the official gameplay trailer, and it’s sitting in the woods. Despite the story being less of a focus this time around, we can’t help but think Breath of the Wild will have an important impact on the greater Zelda lore. That’s not all — musical themes, sound effects, and various items fans recognize will be in the game. 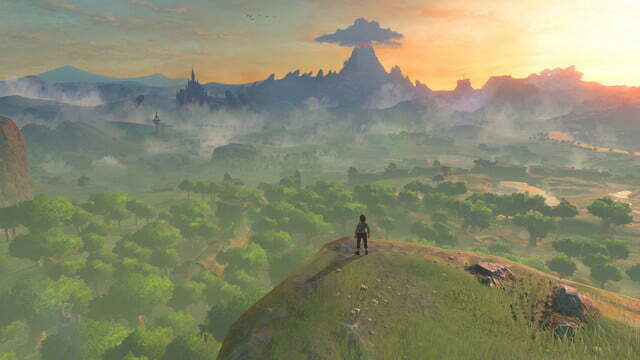 If the gameplay changes sound sweeping, the aesthetic and sound of Breath of the Wild are still very much what you have come to expect from the Zelda series.